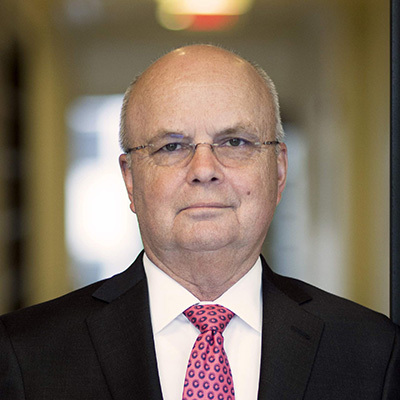 General Michael Hayden is a retired four-star general who served as director of the Central Intelligence Agency and the National Security Agency when the course of world events was changing at a rapid rate. As head of the country’s premier intelligence agencies, he was on the front lines of global change, the war on terrorism, and the growing cyber challenge. He understands the dangers, risks, and potential rewards of the political, economic, and security situations facing us. Exclusively represented by Leading Authorities speakers bureau, General Hayden dissects hot spots around the world, analyzing the tumultuous global environment, the impact of the recent US election and what it all means for Americans and America’s interests. He speaks on the delicate balance between liberty and security in intelligence work, as well the potential benefits and dangers associated with the cyber domain. As the former head of two multi-billion dollar enterprises, he can also address the challenges of managing complex organizations in times of stress and risk, and the need to develop effective internal and external communications. Views Highly Sought After. Hayden has been a frequent expert and commentator on major news outlets and in top publications, valued for his expertise on intelligence matters like cyber security, government surveillance, geopolitics, and more. He was featured in the HBO documentary Manhunt, which looked at espionage through the eyes of the insiders who led the secret war against Osama bin Laden, and in Showtime’s The Spymasters, a detailed look at the directors of the Central Intelligence Agency. Still Involved. Hayden is currently a principal at the Chertoff Group and a distinguished visiting professor at the George Mason University Schar School of Policy and Government. He is on the board of directors of Motorola Solutions and serves on a variety of other boards and consultancies. In 2013, the Intelligence and National Security Alliance (INSA) awarded Hayden the 29th annual William Oliver Baker Award. General Hayden is also the first recipient of the Helms Award presented by the CIA Officers’ Memorial Foundation. In 2014 he was the inaugural Humanitas visiting professor in intelligence studies at Oxford University in the United Kingdom. His 2016 memoir, Playing to the Edge: American Intelligence in the Age of Terror, was a New York Times best-seller and was selected as one of the 100 most notable books of 2016.